The current survey is the fourth time Gallup has measured Americans' overall views of capitalism and socialism in this format. The question wording does not define "socialism" or "capitalism" but simply asks respondents whether their opinion of each is positive or negative. Democrats' and Republicans' sharply contrasting views of the two economic systems are not unexpected, given the history of the two parties. Republicans and Republican-leaning independents have notably positive views of capitalism and negative views of socialism. Democrats, by contrast, are less unified in their views, but by 10 percentage points are more positive about socialism than about capitalism. A majority of Americans have retained a positive view of capitalism over the past eight years, but this year's 56% positive rating is by four points the lowest recorded since 2010. This modest drop in positive attitudes toward capitalism was driven, as reviewed above, by the less positive attitudes among Democrats. Despite the increasing prominence of socialism in the public discourse in recent years, little has changed in Americans' attitudes toward the concept at the national level. Americans' positive views of socialism have varied only between 35% and 39%, with this year's reading of 37% right at the trend average. Americans' positive views of several of the eight items tested are slightly less positive this year than in 2016, including a six-point drop in positive views of free enterprise. Just off the top of your head, would you say you have a positive or negative image of each of the following? 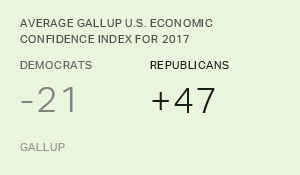 As might be expected, Republicans are significantly more positive than Democrats about free enterprise and big business, consistent with their more positive views of capitalism. There are smaller differences in partisan views of small business and entrepreneurs (both groups are quite positive toward these) as well as the federal government (with well less than half of both groups holding positive views). A majority of Democrats have viewed socialism positively each time Gallup has measured the concept since 2010, and -- despite the increased visibility given to the concept this year -- those views have not changed substantively. But the drop in Democrats' positive views of capitalism this year has for the first time left Democrats more positive about socialism as a concept than about capitalism. It's possible that the drop in Democrats' positive views of capitalism is related to Donald Trump's presidency. Trump is an enthusiastic capitalist, and his administration's efforts to roll back regulations on business and industry, as well as the tax cut law that is advantageous to businesses and corporations, may have caused Democrats to view the entire capitalist enterprise with less positive eyes. The talk about the Democratic Party moving more toward socialist policies in its platforms in this year's midterm elections was muted with the failure of several socialist candidates to capture their party's nomination in recent primary voting. And, although a majority -- even if not an overwhelming one -- of Democrats nationwide react positively to the word "socialism," the strong antipathy toward socialism among Republicans and Republican-leaning independents suggests a political campaign favorable to socialism would not play well in a general election. Socialism as a concept is open to many interpretations. Gallup was describing socialism in questions asked in the 1940s in terms of government ownership of businesses -- something that Sanders, Ocasio-Cortez and most other left-leaning Democratic candidates have not advocated. Instead, socialism today seems to embody sets of programs by which the government helps regulate and in some instances run and pay for social programs focused on basic population needs in health, education, housing and employment. Socialism clearly sounds better as a concept to young people than to those who are older, as it has over the past eight years. Evidence for this is found in the strong support younger voters gave Bernie Sanders during his 2016 presidential campaign (despite his septuagenarian status) and in the candidacy of Ocasio-Cortez (who is herself 28 years old). 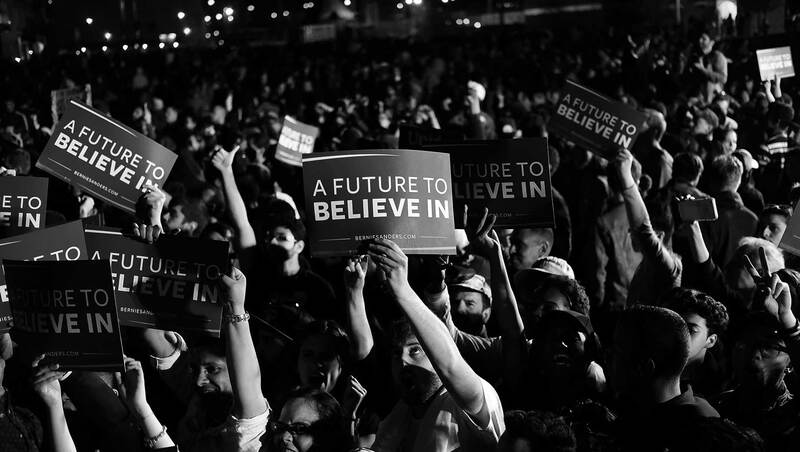 Whether the appeal of socialism to young adults is a standard function of idealism at that age that dissipates as one grows older, or will turn out to be a more permanent part of the political beliefs held by the cohort of millennials who have come of age over the past decade, remains to be seen. Results for this Gallup poll are based on telephone interviews conducted July 30-Aug. 5, 2018, on the Gallup U.S. Poll, with a random sample of 1,505 adults, aged 18 and older, living in all 50 U.S. states and the District of Columbia. For results based on the total sample of national adults, the margin of sampling error is ±3 percentage points at the 95% confidence level. All reported margins of sampling error include computed design effects for weighting. Americans Say Economy Is "Most Important Thing Going Well"
Americans' leading top-of-mind response to what is going right in the U.S. is the economy; at the same time, their ratings of U.S. economic conditions have reached a 14-year high. The Wells Fargo/Gallup Small Business Index finds that optimism among small-business owners is at its highest level since measurement began in 2003.